Evergreen palm-like plant. Full sun to light shade. Height 10’. Spacing usually used singly. Habit: A primitive, rugged trunk, plant with feather-looking leaves and the appearance of a palm. It is related to conifers and ginkgo trees. Trunks are typically 1 - 2’ in diameter and can branch. Stems (petioles) have small protective barbs. Slow growing. Male sago palm flower will produce long, golden cone-like structures, somewhat like large pinecones. Males may produce multiple cones. If no female is nearby or you don’t plan on propagating additional sago plants, you remove this structure from the plant without causing it any harm. You may want because they are quite toxic, especially to dogs. Female flowering sago palms produce round, golden, fuzzy masses. When ready to be pollinated, the flower will slowly open up usually around late spring or early summer. Without a male nearby, however, pollination will not occur. Therefore, the orange, walnut-sized seeds will not become viable. The chances are good that the seeds will be able to produce new plants. Culture: Grow in bed or deep pots with quality potting soil. Need both male and female plants to produce seed. Slow growing. Plants can be started by seed or pups. Feed with mild application of organic fertilizer 2 – 3 times per season. Use: Evergreen dramatic specimen for beds or containers and can make good bonsai plants. Problems: Freeze damage in harsh winters in zones 8 and colder. When maintained under an organic program, these cycads can tolerate zone 8 (that of the Dallas Fort Worth area), but when using synthetic fertilizers freeze damage should be expected. All parts but especially the flowers and seeds are extremely dangerous to pets, especially dogs. Notes: Cycads have changed little during the last 200 million years. Native to Japan. Seeds are poisonous to dogs. 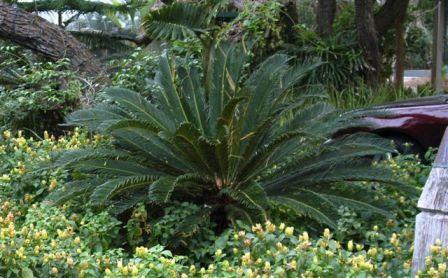 The leaves from the sago palm can cause severe damage to the liver and potentially death when they are ingested by dogs. 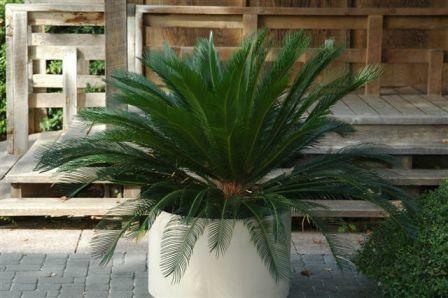 All parts of sago palm are poisonous, but the seeds (nuts) are the most toxic part of the plant. Sago palm contains cycasin, which is the primary active toxic agent resulting in severe liver failure in dogs. Ingestion results in acute gastrointestinal signs (e.g., drooling, loss of appetite, vomiting, diarrhea) within 15 minutes to several hours after ingestion. Central nervous system signs (e.g., weakness, ataxia, seizures, tremors, etc.) and severe liver failure can be seen within 2-3 days post-ingestion. Clinical signs include vomiting, diarrhea, lethargy, inappetance, abnormal fluid accumulation in the abdomen, abdominal pain, jaundice, and black-tarry stool. Aggressive decontamination and treatment should be initiated. Even with aggressive treatment, the survival is about 50%. Unfortunately dogs are sometimes highly attracted to this danger. Sometimes getting the dog to vomit is good, but not always. Owners should never attempt to make their dogs vomit without first consulting a veterinarian. If a local vet is not immediately available, call the ASPCA’s Animal Poison Control Center (888-426-4435) or the Pet Poison Helpline (855-213-6680). Both hotlines are staffed 24 hours a day, 7 days a week and are available to owners at a small charge. National Poison Control line is also available for help at - 800-222-1222. A: Way too far north for them to be outside. Cut the dead fronds off, drench the soil with Garrett Juice or a homemade aerated compost tea and cover the plants with floating row cover if more cold weather comes this way. For long term success with sago palms, move to Houston.